Conversely ‘interleaved practice’ – where students learn many different skills in a mixed up fashion – has been found to impair performance during immediate practice but improves long-term performance and students’ skills transfer. Neuroscientists have proven that if practice is undertaken in an interleaved fashion, task-relevant brain areas demonstrate enhanced communication and coordination, beneficial for long-term performance. Importantly too research has also shown that students who learned in the mixed up fashion, the interleaved practice, are more likely to also do better if presented with an unexpected task compared to those students who have learned in a massed practice way. 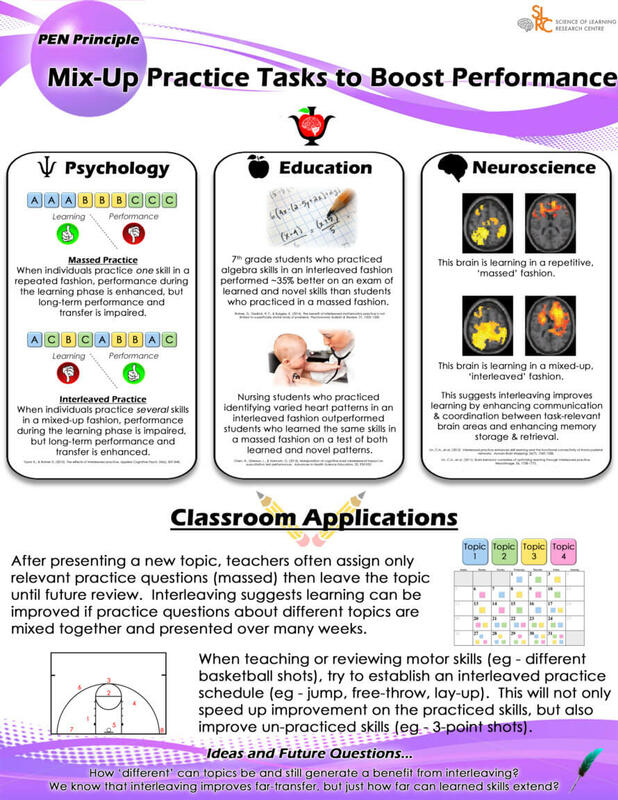 The Mix-Up Practice Tasks to Boost Performance message is among a series of new PEN Principles – Psychology, Education and Neuroscience – developed by Australia’s Science of Learning Research Centre (SLRC) to assist teachers and students across the country.